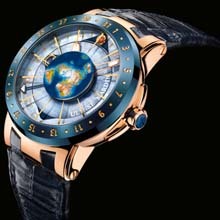 Seventeen years after the completion of the historical astronomical "Trilogy of Time" Ulysse Nardin has developed another revolutionary astronomical timepiece with the distinct DNA of Dr. Ludwig Oechslin. Dr. Ludwig Oechslin’s concept focused on the system of Sun, Earth and Moon, concentrating on the scientifically accurate depiction of the moon phase, and the global influence of lunar and solar gravitation, resulting in the ebb and flow of the tides. By combining the movement of two rotating discs in one display, the moon phase indication is so precise that more than 100,000 years will have to pass before it shows a full moon rather than a new moon (or vice versa). The Moonstruck simulates the rotation of the Moon around the Earth, as well as the apparent movement of the Sun around the globe. The latter is shown by another disc, rotating once every 24 hours. This permits the determination of the current moon phase in relation to any location in the world. The Moonstruck also shows the global dynamics of tides that depend upon the gravitational effects of Moon and Sun. This revolutionary mechanical wristwatch illustrates the current tidal status and trend in relation to specific coastlines or oceans. The cumulative influences of the Moon and Sun which result in spring tides are also clearly shown. The Moonstruck is a practical travel companion. It features a pointer calendar and a quick-setting device to adjust the hour hand forward and backward to any desired time zone by pressing the pushers plus and minus located at 2 and 4 o’clock. 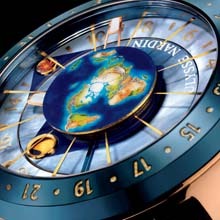 The Moonstruck is a Ulysse Nardin in-house development. The manufacture caliber UN 106 features a silicium escapement and a hairspring made with the latest silicium technique. The Moonstruck is available in a limited edition of 500 pieces in 18 ct red gold and 500 pieces in platinum.